Holding events are a great way to involve students, build awareness of your group, or even just show off a bit. Students give a fencing demonstration. Before you decide on an event, talk in your group about what kind of event you want to have. What are your goals? Do you have enough people to effectively organize, promote, and run the kind of event you want? Workshop - interactive session with a facilitator. Speaker - lecture or presentation by a member of your group or an off-campus guest. Performance - music, theater, comedy, dance, and more. Film showing - presentation of a film related to your group, possibly with discussion afterwards. Work party - time for group members and other interested students on a volunteer project. Once you have an idea what kind of event you want to have, talk to your advisor. They have experience helping groups like yours put together successful events. You'll discuss budget and outreach. They'll let you know what paperwork you need to complete. A great event is one where people can walk away with something: new skills, heightened awareness, new friends, or a memory of a fun experience. Having a great event also means thinking about timing. When planning your schedule, consider when people on and off campus are available. Check the Campus Calendar to see if other events are already scheduled. Consider a space that matches the vibe of your event. How many people do you expect? What will they be doing: listening to a speaker, working in small groups, dancing? Do you need projector or sound? Do you need a stage? If you want people from off campus to come, think about how easy the room is to find, too. See if the room you want is available before you talk to your advisor. The number one problem: not enough people at the event. Even with an interesting topic, fun activities, a good space, and the right day, you need to tell people about your event for it to be a success! Start getting the word out two to three weeks ahead of time. If there's limited access or you have a big name performer, start even earlier. Your major ad blitz should come the week of your event. Get more fliers up, and tell everyone you know. Students often decide what to do right before they do it. Members of the student group Coalition Against Sexual Violence hang shirts on Red Square for the Clothesline Project. According to Student Activities surveys, word-of-mouth and fliers are still how most people learn about events. Come up with an elevator pitch about your event. If you have a few seconds with someone you know who's not part of your group, why would they come to this event? You can use this as a basis for fliers, announcements, or other advertising. These are the basic things to do for any event. If you have a performance or a notable speaker, you may want to consider other venues like an ad on KAOS or in the CPJ. What to include: name of the event, date and time, location, and who is hosting, including your group's name. 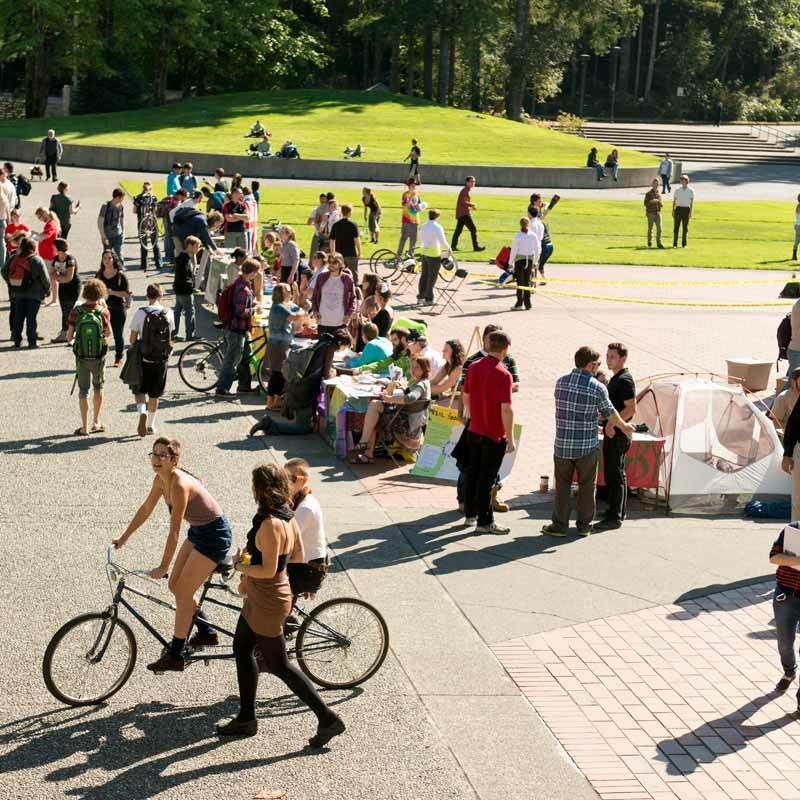 If you're posting fliers or handbills off campus, include "The Evergreen State College" as part of the location. You may want a short blurb about the event, but keep it SHORT. Other student groups: if your event is a good match with another group's interests, see if they will announce your event to their members. Academic programs: if the subject of your event is relevant to your program, let your fellow students know! If you think there's an educational component to your event, look through the catalog. If you find a program that's a good match, contact the faculty. They may let you announce your event in their program; they may send information to their students, or they might even require attendance. Lots of events can be held for free. The best ways to get attendees to attend are free. Space on campus is usually free. Students or local volunteers can help with presenting or recording. The most important thing to budget is time. But some events will cost money, and Student Activities can help. Talk to your advisor about your needs. If you haven't previously submitted a budget, you'll need to do that too. It can take up to four weeks for your budget request to go through. This is just the beginning of event planning. To build your skills for event planning on campus, sign up to attend an Event Planning workshop with Greg Porter. If your group plans to host events on campus, at least one coordinator is required to attend. Check your materials: name tags? pens? clipboards? laptop? adapters! Put out a green sign. Review the space & make sure it's set up properly. Promote your group with a sign up sheet. Turn in your checked-out equipment. Turn in receipts, contracts, or any other paperwork. Fill out the evaluation worksheet. Debrief with your group. Evaluate whether the event was worth the work and whether it will build membership. Follow up with any attendees who sign up.